TunnelBear is one of the most popular VPN brands around. It’s renowned for the level of security and anonymity that it provides to its users. With servers in more than 20 countries which include the US, UK, and Canada, the service can be used to bypass geo-restrictions on hundreds of popular online channels. TunnelBear is relatively new compared to many other VPN services. Born in 2011, TunnelBear is among the giants of the VPN industry. Despite its linkage to Canada, the company has not only survived but prospered in the cybersecurity industry. TunnelBear has servers in 20 countries. While paid users can access all of TunnelBear’s servers, free users aren’t allowed access to the Australian server. Subscribers can connect to TunnelBear’s servers on any device, be it Smartphone, Laptop, Tablet, or even a VPN friendly Router. Because TunnelBear permits 5 simultaneous connections, it can be used on all the devices that you may have at your home. Because TunnelBear is based in Canada, it has to follow the rules and laws enforced by the Canadian government. P2P file sharing is banned in Canada, and this is why the VPN service offers no features or support for this feature. So if you want a VPN for torrenting, we suggest that you avoid using TunnelBear. TunnelBear disallows your data from leaking outside the VPN tunnel, even if your VPN connection drops out. This keeps your unencrypted data safe from the eyes of your ISP provider, and makes sure that you remain as anonymous as possible on the internet. GhostBear works like a stealth mode option. It makes it impossible for firewalls to detect the encryption of GhostBear protocols by making it seem like ordinary Https traffic. This allows users to bypass firewalls which include the Great Firewall of China. Using this feature can reduce your online speeds, turning this feature off does not affect the overall security of your connection. Because TunnelBear is based in Canada, it has to follow the rules and procedures of the country. Canada isn’t considered as a privacy friendly country. It has rules which allow its surveillance agencies to openly spy on the local population. TunnelBear disallows users from sharing copyright-protected material from its servers. Additionally, it asks users to abide by the rules and regulations of their country. Because the service is based in Canada, we suggest that you refrain from doing anything even remotely illegal when connected to TunnelBear’s servers. On the encryption front, TunnelBear offers two different kinds of protocols to its users. Windows, Mac OS X, and Android users can use the OpenVPN protocol, while iOS users have the choice to either use Layer 2 Tunneling Protocol (L2TP) or Internet Protocol Security (IPsec). In addition to strong encryption, TunnelBear also took the step of fixing any IP leak issues that it previously had. 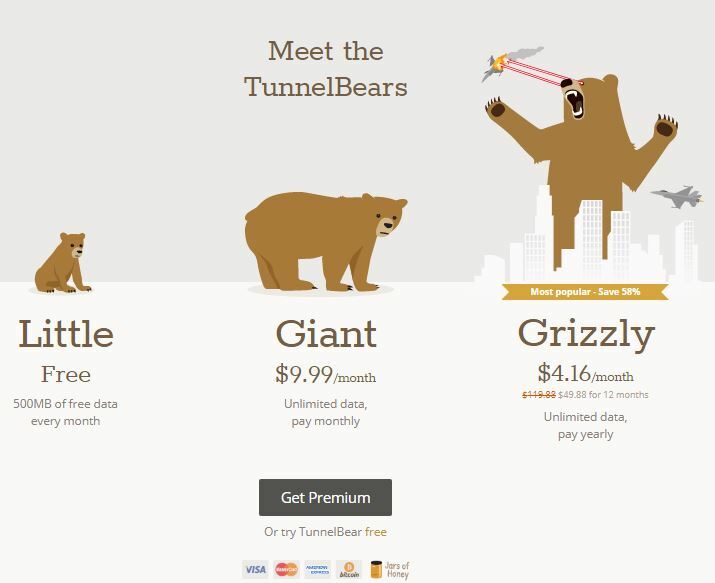 TunnelBear offers three pricing plans to its users: Little, Giant, and Grizzly. One of these is a free plan that allows users to use TunnelBear without paying anything. The Little Plan allows users to use 500mbs of data every month. Additionally, it allows users to connect with all of TunnelBear’s servers except for Australia. Giant plan costs $9.99 per month and offers unlimited use of its service. Grizzly is by far the best plan as it offers the complete service for $4.16 per month ($49.88 per year). In terms of features, both plans are completely identical.